Your inner Wild Woman has been calling your name for a while, she is the one who led you here and now and it’s time to acknowledge and unleash her… let her out! By connecting with Your Wild Woman, you are choosing to remember who you are and what you are here to do. During this Intentional Creativity workshop, you will get to reveal a story that has been limiting you. You will get to choose to release it and start the telling of a new one. All along, you will be held in sacred space and guided to turn within to connect with your wild wise self. How do you feel when you hear the theme of this creativity loveshop: Unleash Your Wild Woman? Do you feel a stirring in your womb, a shiver down your spine or a spasm deep in your bones? If so, consider the possibility that it’s an old, old memory coming back to life, a memory of a very special connection with the wild feminine. Your inner Wild Woman has been calling your name for a while, she is the one who led you here and now and she is letting you know through your body that it’s time to acknowledge and unleash her… let her out! Do you wonder what it even means to Unleash Your Inner Wild Woman? According to Clarissa Pinkola Estés, who wrote Women Who Run With the Wolves, “wild means to live a natural life, one in which the creature, has innate integrity and healthy boundaries. Doesn’t it sound great? Don’t you want to remember who you are and what you are about? Don’t you want to remember what you are here to cause and create in the world? Don’t you want to learn to create healthy boundaries? That’s the inquiry I will guide you on during this creativity loveshop. This relationship with your Inner Wild Woman is a lifelong journey of exploration and discovery, let’s walk one step together on May 23rd from 1-8pm. 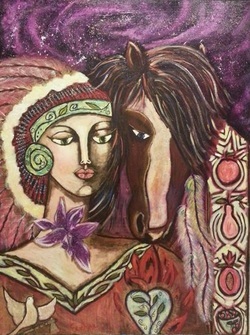 I will guide you through visualization, journaling and painting in a series of steps where you will connect with your Inner Wild Woman. You will get to restore your connection with her if it’s not done yet and build up your relationship with her. You don’t need to know how to paint, the outcome on the canvas is not important, even if you could be very surprised at what you can produce. What is important are the journey and the questions. - Your end-of-the day fatigue to come from satisfying work and endeavors, not from being shut up in too small a mind-set, job, or relationship. - You to know instinctively when things must die and when things must live because you know how to walk away, and you know how to stay. - You to glow and people telling you!!! ... then sign up and join me on this adventure!!! - I will probably think of something else as we get closer so I will send you an email in the week before we meet. We will meet in a private residence in Traverse City. I will disclose the location upon registration. Space is limited so register in advance. If you are interested but cannot do that date, let me know and I will add a date on the calendar.